Do we really need yet another self-proclaimed, so-called expert? If you are anything like me, your answer would be a big fat NO! And yet here you are...likely looking for answers to many of your auto detailing and car care questions; trying to figure out whether or not Darren is worth giving a moment of thought or credibility to. What is Your Real Question? If you are more interested by what you can personally gain through this website, then I suggest you simply visit my home page. If you would like to read the comprehensive chronological order of things, you are welcome to visit my History of Auto Fetish page. 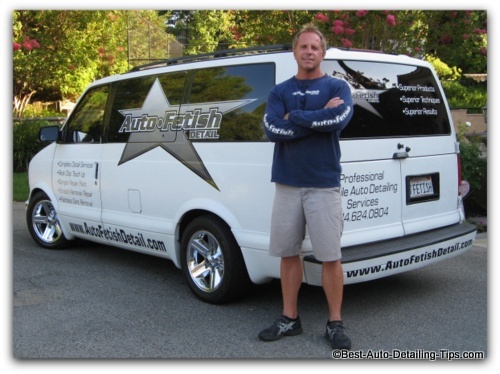 Best Auto Detailing Tips is "detailing made simple". It's showing you how to get from point A to point B. Easier and with better results. If you are like most people you have a life. Depending on you and your "life", this may include but not limited to making a living, raising kids, going to school, hanging out with friends, etc., etc. While many consider spending an entire weekend washing and waxing their car therapeutic, I believe many more people would like to short cut the process of car care and enjoy the benefits of the effort, rather than the effort itself. As the proverbial saying goes..."Those that can do, those that can't teach." The exact products I use professionally. Techniques that allow to produce better results with less effort. A voice of reason produced form 25+ years of professional experience. I don't need to spend much time here as you can go to my Auto Fetish Detail History page and read the comprehension version of my professional world. For the sake of keeping it short and to the point, my decades of experience are brought to you first hand by myself. Between the pages of this site and my Youtube channel, I make ever effort to over-deliver with useful information that cuts to the chase and done so without all the hype found in so many other places on the Web.